Heavy Duty Heat Transfer Vinyl - Great Iron On HTV Vinyl. Create your own design and transfer it directly on to any cloth item of your choice such as t-shirts, bags, cushion covers, pants, jackets, etc. Works good for Cricut, Silhouette cameo, Heat press machine or any craft cutters. 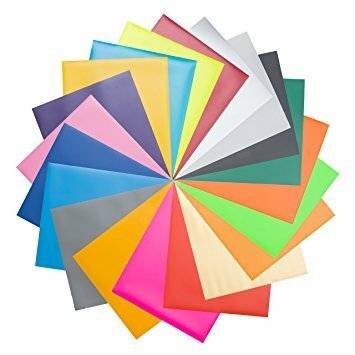 HTV Vinyl Bundle In Great Assorted Color - The selection of colors is great with 12 most popular Easy Weed colors, including White-01, Black-02, Royal Blue-03, Orange-08, Yellow-06, Silver-13, Sun Yellow-28, Flor. Pink-19, Flor. Green-18, Light Pink-65, Red-05, Gold-12 and the weight of the film is perfect. Nice Gift Choice - Great vinyl, easy to use!Items come out looking professional. Perfect for Halloween costumes! Good choice for Christmas and birthday party gift to your creative kids or friends. Fantastic for a fun project. If you have any questions about this product by POYN, contact us by completing and submitting the form below. If you are looking for a specif part number, please include it with your message.